I wish self-love was as easy as breathing, as easy as loving my children, but for me it’s not. If you’ve ever looked in the mirror and found fault with everything looking back at you, this post is for you. I don’t remember where or when it started. It seems so ingrained to my being, like my brown hair, my freckles, my brown eyes. I think that voice has been a part of my inner conscience from inception. But why does she ALWAYS have to be so negative? Why is it that every day she can take a moment and mar it with her rude attitude? For me, it’s not even just that voice of negativity and what she does to the lack of body image I already have- it’s what she takes away from during my everyday life. She takes enjoyment from taking pictures of every day events with my family, getting ready for a special event, getting dressed to take my kiddo to school. She is there just as sure as there is air to breathe. Sometimes I have a conversation in my head where I’m telling that other voice to back off and that she is not going to ruin this moment in time. Somehow we get through part and by the end she is back to her old nagging ways. So how do you turn it off? How do you say enough is enough and get that voice to mute? How do you turn on the self love and positivity? I literally have moments where I look at myself in the mirror and say “Hey, you have worked SO HARD! You are smaller than you were in 6th grade. You can run A MILE (actually more, but in school I could never do that). You’ve given birth to two beautiful boys who love you. And you’re married to a guy that adores you.” If I’m good enough for them, why can’t I be good enough for me. Why do I let numbers on a scale define me? What does my pant an shirt size have to do with my self worth? If I were a size 8, 6, 4, 2, 0, would I be able to love myself then? How about if I weighed 160 lbs? 150? 140? Could I love myself then? Would I be enough then? No. I know the answer though I can rationalize the why. 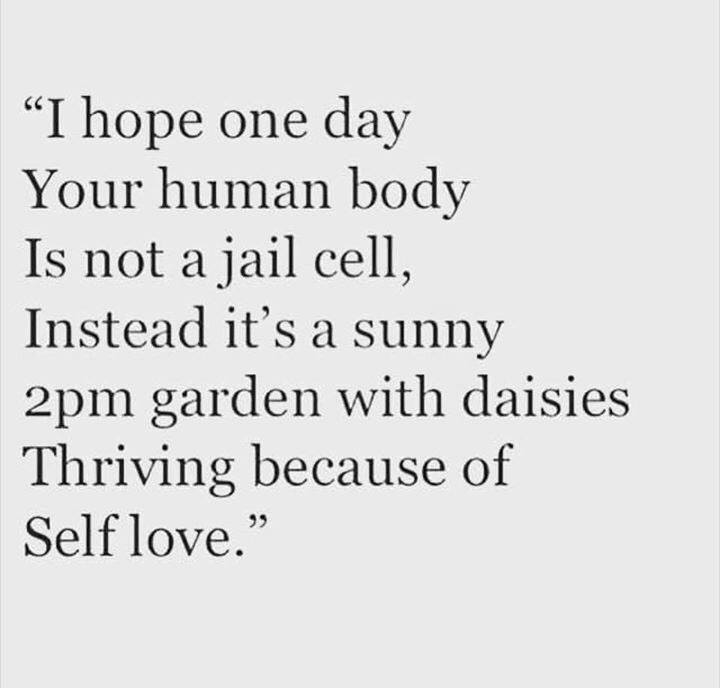 I know I have to make self love a part of my daily routine. The problem is just getting that voice in my head to start sticking. I would never say or think these things about anyone else, so why do I think them about me? I hope one day I overcome this. I hope that I have more good days than bad. I hope I can look at myself in the mirror and be glad I’m wearing clean underwear and brushed my teeth, if those are the only positive things I accomplished that day. I hope I can remember that life is a journey, a collection of moments, where the positive light can outshine the negative self doubt. If you raised your hand, I assure you you are not alone. You are brave. You are beautiful. You are a light in this world. Almost every successful business endeavor has a mission statement, a guiding principle, that sets the intention of what their goal is, what they are striving to achieve. It should be the same for you. What is your guiding principle? At the end of the day, what are you striving for? What mark are you trying to make on this world? A year ago, I would not have been able to answer that. I would still tell you I have difficulty defining it into one statement. So I thought it may be prudent to work together to set a mission statement for ourselves. Ready? Let’s begin! Step 1: Identify your past successes. What have you recently been successful with? This could be at home, at work, in public, wherever. What are your strengths? Some people are really good at identifying them. Each year on our employee self-evaluation form, we are asked to identify our strengths. Each year I struggle with it. For me, it feels like bragging or being self-centered. Try to step outside of those feelings and let yourself be proud of the things you bring to the table. Step 2: Identify your core values. Think about those things that identify who you are as a person and your priorities in life. Make the list as long as you need to, and when you’re ready, select 5 or so to keep for your statement. Step 3: Identify contributions. Think of ways you impact the world, your family, friends, your work environment. What positive light do you shine? Step 4: What are your goals? What are you hoping to accomplish? 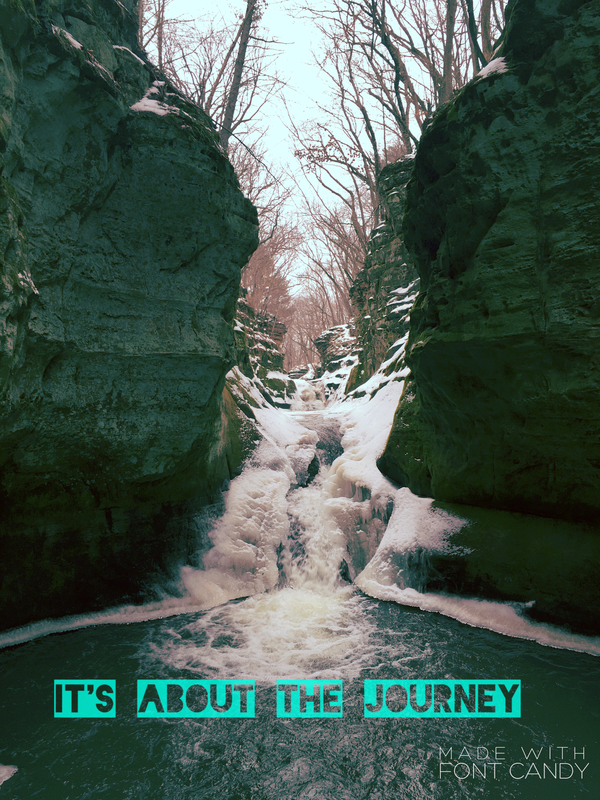 Where do you want your journey to take you, or even better, what sort of journey do you want to be on? Think short term, but also think long term. Step 5: Combine to form your statement. Review the lists you have worked on, find an underlying theme or guiding principle, and use it to form your personal mission statement. Step 3: I have had others reach out to me to tell them my public sharing of my weight-loss, work out, healthy lifestyle journey has helped them feel supported and inspired. My children tell me I’m the best mommy in the world. At work I have had feedback about being a good leader, team player, and that I take on projects and see them through. Step 4: To set a good example for my children and others. To hold myself accountable to the hopes and dreams I have laid out before me. To remember that I am human and there will be bumps in the road. To appreciate myself for the person that I was, that I am, and that I’m trying to be. 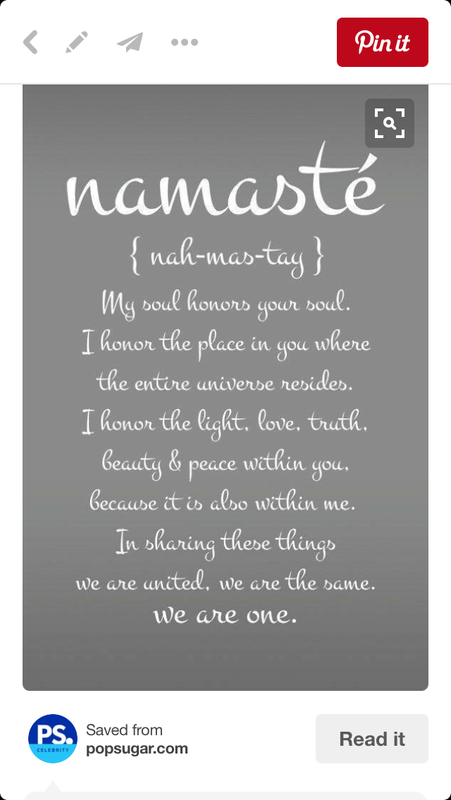 To awaken each day with an open-mind and heart, to support and inspire my beloved family and friends, to be present in each moment in life remembering where I have been and where I am going on this journey in life. Time has a way of slipping by if you aren’t vigilant! Lately I can’t find enough time it feels, and seeking balance has been difficult. This past year has been a season of many changes for myself. It started off losing my identity in my career field. I just wasn’t doing what I loved anymore. That had never been an issue for me. I’m a very driven, very focused individual. My career path has always been something to hold steady. When I lost my drive for work, I found a new outlet. I found diet and exercise. Not found it, but maybe rediscovered it in a way that made me open my eyes and realize that I can no longer be selfish about the way I live. I have to think about the habits and lifestyles I am showing my boys. The drive I used to have for work I put towards a couple of workout programs. I do well with set goals and expectations, so following these programs was something that came relatively easy as far as the idea and demands. I had no idea what a year later would have in store for changes. My newfound workout hobby has turned into a little of an obsession. My Type A, Perfectionist, Self-deprecator is very naggy when I don’t work out for a day, or two. But in that, I found my passion for helping people in the same state I am in. Wanting to be healthy, feeling alone at times, and wondering where to turn next. My goal is to surround myself with people who just need an uplifting voice, someone who believes in them and shares in their goals, people who can believe in my goals and support me along the way. If you can scroll through your facebook feed or instagram without seeing social media posts about celebrities quickly dropping the baby weight, or incredible body transformations, I’m amazed! I seem to see them every other post. And while I find myself jealous and in awe at times, I realize that most of those results are photo-shopped and, quite honestly, not realistic. I have to focus on turning off the inner negative voice and remember the positives: Today I woke up with two blessings, my eyes. I was then blessed with a few more, I sat up and was able to get out of bed without any type of assistance and walk. My biggest blessings followed about 2 hours later when I woke them up after my workout and shower, my boys. Change is never easy. It takes 21 days to start a new habit and 90 days to make a lifestyle change. The hard part is having the courage to show up every day, know that you won’t be perfect, you will make mistakes, eat something you ENJOY (but maybe isn’t healthy), and miss workouts. But everyday you wake up, you are able to start fresh and make choices. Choices that can make you grow older, or make you grow younger. Life is about balance; enjoy the life you have and be grateful for all of the things on your plate. God has blessed you with this body and with this day. What you choose to do with it is on you, but you can surround yourself with a tribe of people to help lift you up and support your goals and dreams. MAKE TODAY YOUR DAY and BUILD YOUR TRIBE! A year ago I would not have believed what giving into 21 days of trying something new could do for me. A year later, I’m 50 lbs lighter, working towards a new career path, selling a home, building a home, and most importantly, being a mom and wife who puts the wellness of my family first so we can all enjoy a happy, healthy life together! Who else has difficulty managing their stress? Stress is a component of our daily lives. It drives us; it aids in our survival. Unfortunately, most of us are exposed to such a high amount of stress, that our bodies become fatigued from handling it. You may have heard of “fight or flight” or adrenaline. This is the hormone that is released in your body in response to stress. When adrenaline is circulated in the body, each organ system responds by making necessary changes to aid in your survival. Over time, our levels of stressed have changed, but our bodies and their response has not. Our body can’t tell the difference between emotional stress or work stress in comparison to being chased by a lion-stressed. Because of that, we experience adrenal fatigue. Adrenal fatigue is a condition brought on by the body constantly responding to elevated adrenaline in the body. Adrenaline is produced by the adrenal glands. Over-stimulation and production are taxing. I find this topic particularly interesting, because I like to function under high stress. If I’m not experiencing, I seem to seek it out. I increase the intensity of my workouts, I add more time, I sleep less, I get in more steps… Anything to try to cope with the stress I find. I feel guilty when I’m not going 150 MPH at all times. Do you find yourself ever feeling like this? It’s hard for me to take time to find solace and respite. I am a caregiver by nature, and if I’m taking time to care for myself, how am I doing a good job of making sure everyone else is taken care of? However, the only way for our bodies to recover from the constant decathlon we subject it to is physical rest. Sleep is the only way our body recharges its batteries. No amount of meditation, mindfulness, or other alternatives can provide what sleep can to the body. We are in the midst of trying to sell our home, while building our dream home. Doing this with two small children is challenging. Doing this with 2 full time workers in the house is also challenging. Doing this while managing schedules for summer school, t-ball, and trying to grow a business seems to add to the insanity. So how do I manage stress? A good workout: I’m currently a little side-lined, as I am battling a stress injury to my foot. This prevents those High-Intensity Interval Training (HIIT) workouts and running I have been doing. (Doesn’t the universe know I’m trying to run my first 10K in less than a month?) Maybe this is why pilates and yoga are my workouts of choice for now. They are low-intensity, lengthening those long muscles, strengthening the core, and designed to focus on breathing and being in the moment. Sleep: I like sleep. It is sometimes a little disrupted, but for the most part I can get 7 hours a night. I would prefer more, and a nap here and there, but I will take what I can get. Girls Night Out- I love my husband, and I would be lost without him, but I am one of those women who need time with my girls. Time to vent, time to laugh, time to talk about all things mom/wife/daughter/sister/aunt/chauffer/chef/waitress/maid/etc. related. My husband thankfully understands this and usually once a month, or at least every month, I get a night out with my girls. It keeps me sane. Date Night- It is also important for me to nurture my relationship with my spouse. Often our roles as providers and parents dominate our life. It is easy to get caught up in the hustle and bustle and forget what brought us together to start this journey. Same as girls night, once a month or every other month, we have a date night. Sometimes it’s as simple as dinner and grocery shopping without our two littles. Cabin Time- This is my all time favorite stress relief! We are fortunate enough that we have our own little log cabin in the woods. Not that we haven’t worked for it, but is the one place I feel most at peace. Something about being in the woods, looking for critters, and throwing rocks in the creek with our boys makes it all the more peaceful. Once the weather is nice, you are hard-pressed to find me committing to anything on my weekends off if there is potential for cabin time. Knowing what causes you additional stress and your methods for coping are some of the most important pieces of your daily journey to health and wellness. If you can figure out what makes you happiest and most at peace, you are already ahead in the game. Try to eliminate the extra stresses you accumulate. It’s easy for me to say don’t sweat the small stuff, but take time to process each item that comes in: Is it necessary? Can it wait? What will happen if I don’t react right now? Taking time to answer a few simple questions will give you time to adjust your body’s response. I love when I can share a piece like this that I am working on myself. We are a work in process, along on this journey together! Life has a way of continuing around you, despite all of the things you have on your plate. I realize I haven’t posted in over a month. I have been so busy working behind the scenes to get this dream off of the ground, that I have not made time to post about what has been happening. My awesome cousin has worked on logos for this dream, and she exceeded every hope and wish I had! I feel excited to have this new identity symbol to place on my little brand. I can’t express enough how grateful I am to her for supporting me on this journey and creating this design to share with the world. Annie, you are truly a gifted artist! Thank you! I have been struggling with my own commitments to clean, healthy eating. Our home life has been turned upside down with a new endeavor, and sometimes you grab at whatever is most readily available. However, my husband is as committed to this lifestyle as I am. He and I were going over a grocery list when we looked at each other and said, “No more eating out.” Even when you treat yourself to healthy options, it is hard to stay within a calorie range and portion when you have delectable foods in front of you. We are back on the meal-planning, meal-prepping bandwagon. It’s much easier with spring finally arriving, fresher food options available, and when you have a partner who wants to help and do the work too! I really am lucky! I feel like Spring is a time for a new start! The leaves and flowers are growing, grass is turning green, the sun is out. Nature is urging us to break out of the winter slump and liven up. I started running (by that, I mean I have ran twice). I have a goal though, I would like to make it to running 10 miles by the end of summer. Keep me motivated and accountable, I like a good healthy banter to keep me going. Sometimes making a change isn’t just about readying yourself to take the first step, but about how you’re treating yourself in the process. How you measure your progress and success will speak volumes as to how you are thinking about yourself. Acknowledging and giving credit to yourself will build up your accomplishments. Treating each step with love and gratitude will keep you grounded and empowered. I think this sounds great- but if you’re more like me, this is a complicated task. I’m the first to admit that I’m a perfectionist. I’m also a Type A personality. Combining the two makes me very successful at attaining my goals, but it also makes me a very successful self-sabotager. When I don’t work out five days a week, or I eat chocolate, I make a mental note about how I’m going to make up for that later. While it keeps me accountable, it can be so defeating at the same time. Being a perfectionist can set you up for failure. No one can achieve perfection all the time. It’s important to have strategies in place to help keep you excited and motivated about the changes you are making! Be aware of the words you are using with yourself- use caution with words like never and always. Give credit where credit is due. Recognize what is within your control and let go of the things that aren’t. You will come out ahead in the long run realizing that you are human. Just do the best you can each day. If the best you have today is getting up, going to work, and coming home… that’s okay! You have made it through 100% of your bad days, so you still are coming out on top. Balance your self-improvement with your self-acceptance. Try not to let becoming a better version of you become an obsession. Making a change for you is the most important step. Your goal should be a deep-rooted desire that speaks to your inner soul. If this goal is something you should do, or your spouse thinks you should do, or something you feel pressured to do, take a step back. Reevaluate and refine until it’s something you are ready to commit to. And then when you’re ready, love yourself enough to start the journey. The story you are living today: is it the one you are telling yourself or the one you are making for yourself? This is why I ask. Today I’m struggling with my own story. My body is fatigued, my mind is drained, and everything within me is screaming to take a break. The story in my head is that if I don’t work out today, I’ll gain back the 60 lbs I’ve lost and all of the hardwork I’ve put in. I am my own worst critic. If I were meeting with you and you were telling me a similar scenario to the story above, I would quickly tell you to listen to your body. If everything is screaming for you to slow down, there is a reason. Your body is not meant to be under constant stress without recovery time. The stories we tell ourselves are often quite different from the movie our life is playing out to everyone else. So as I sit here and struggle with counseling myself, I realize this is a common theme for me. Continuing the self-sabotaging story takes away from all of the hard work I’ve done and the goals I have accomplished. It doesn’t erase the fact that I have conquered my first month of Insanity workouts again. One day missed will not ruin the month of physical intensity I have rocked every other day. So to treat myself and not wallow in my sad story, I will spend an evening with a good friend to buy a new dress or pair of jeans that fit this new physique I’ve earned. Moral of the story: When you tell your story, tell your best story! Whenever I approach something new, I have to ask myself if there is time in my life for it. My time is precious, and I need to know if this is something to make me a better person, or if it will take away from me. That’s how I used to approach self-care. As a caregiver in many roles of life, I was great at providing for others, but not so great at taking care of myself. I often felt like I had to ask for permission to take a bath. It was hard for me to step out of the role for even that amount of time. The problem is, I would become worn out. I was crabby with my kids, felt disconnected from my spouse, and would show up to work with a bad attitude. Meanwhile, I still had laundry, groceries, house cleaning, and a plethora of other things I didn’t have “time” for. When I started to incorporate physical activity into my daily life, I was seeking a balance. I felt compelled to work out for 60 minutes a day. I’m not sure why, but I felt if I didn’t reach that special number, then whatever I did wasn’t good enough. I felt guilty asking for 60 minutes to better myself. I was taking that time away from my family, from tasks I needed to do. I look back now and see that the time I took was time to help me clear my head, sort through problems and situations, reconnect with my own body, mind and spirit. It is how I also figured out how lost I truly was. Self-care is not a luxury, but a necessity. We are only given one body and one life. If you don’t take care of it, who else will? Believe me, I am the queen of knowing just how many other things are important in every day life. As much as it feels great to have laundry folded and put away, clean toilets, and beds that are made, the world won’t stop spinning. There will be more laundry to do tomorrow. And those toilets, please… are they ever clean enough? Have you heard that story about the college professor and a mason jar? To paraphrase it quickly, he took turns filling the jar with items. First, he put in as many golf balls as he could. Then he added small rocks, pebbles. When he could add no more of those, he added sand. And he finished with 2 cups of coffee. The golf balls represent the big important things in your life: family, friends, etc. The pebbles represent the day to day things you need to do: go to work, chores, pay bills. The sand is all of the other stuff that can get in the way. If you fill your jar with sand first, you won’t have room for the real important things in your life. And the coffee, well, there is always room for a good cup of coffee with a good friend. Heed this story if you think you don’t have time for you. You are just as important as the rest of those you hold near and dear. If you aren’t looking out for yourself, who else will? Be present in your body, listen to what it is trying to tell you. You don’t need 60 minutes a day. Maybe you need 15 of quiet meditation and reflection. But listen. Time is there if you are willing to make it. 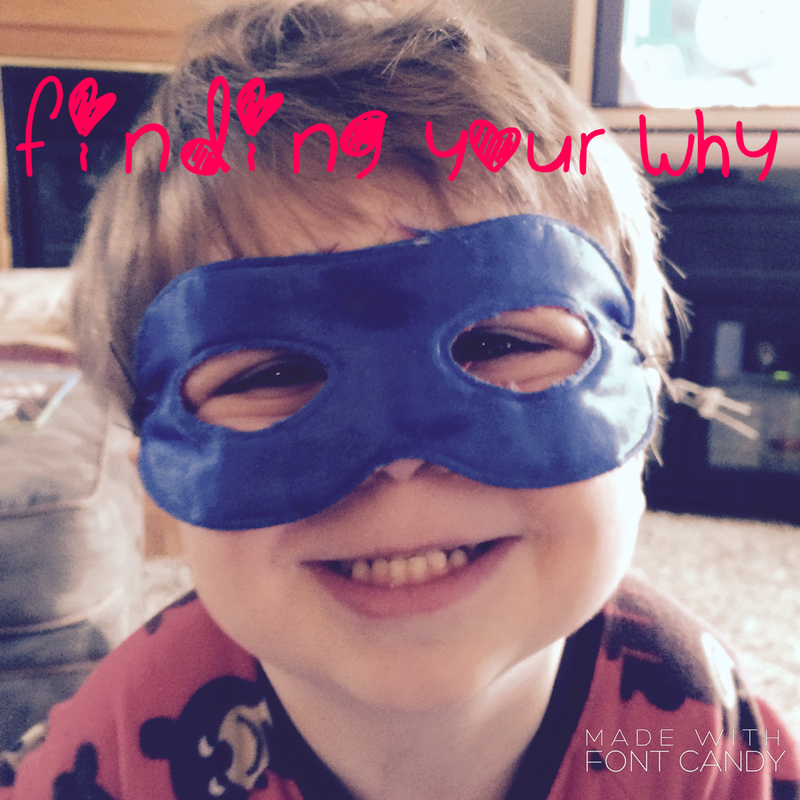 If you are considering any new goal or course of action, your best chance for success is to have a WHY: your purpose. It may sound simple and menial, but today our world is full of distractions. We are task-oriented and tend to focus on what we have to do instead of what we want to do. Sometimes that to-do list can seem overwhelming. This question isn’t meant to be the greatly pondered answer to your life. It’s simply a list of things that are most important to you at this moment when change may be on the horizon. Make a little list of things you love or love to do. Once you have that list, prioritize why it’s important. What is special about that person or that hobby? Try not to overthink your list- your answers are personal and individual. Think about how much time you get to spend with these special people or doing your favorite things. Is it as much time as you would like to spend? That’s ok. When I first felt lost, my list was things I felt like I had to do, so I had to like them and prioritize them. The truth is, I had buried the parts of me that are my identity because I was too busy fulfilling all of my other roles: I wasn’t listening to my true self. What makes you come alive? What gets you excited? What makes your eyes light up? Do you start using hand gestures and talking fast when describing it? Then you might have found something! What are your innate strengths? Toot your own horn. There is only one you and you have your own skill set and gifts to share with the world. You are valuable! Where do you add value? Think of how you use your strengths. What is a situation you feel satisfied with where you were able to be you and shine? You will be more successful considering your strengths and those things you are innately good at. How will you measure your life? When you look back, what do you want to see? Where do you hope you will have spent the majority of your time? Things that matter the most to us, are rarely things. Make a stand for those things most important to you and live your life in alignment with that purpose. That’s ok too. Sometimes you need a little shake up to find where you are meant to be. Sometimes the fear of trading routine for passion isn’t so easily pursued. We have bills to pay and responsibilities to attend. My hope is that I’ve given you something to ponder. If you are in alignment with your greatest purpose, that’s amazing and I applaud you for knowing yourself and what you stand and strive for. If not, maybe I can help send you a life raft while you ride out the waves. A Health Coach isn’t like your doctor, dentist or optometrist… but maybe they should be! Anyone can see a Health Coach. 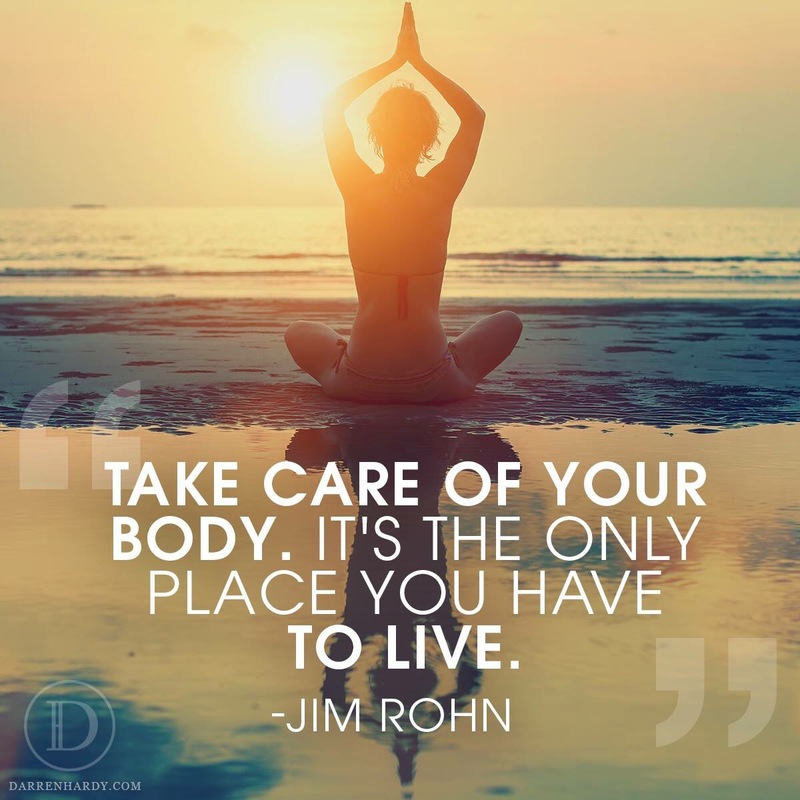 A Health Coach is here to help you develop, cultivate, and support your healthy life-style. Whether you have a goal in mind, are looking for support, or are looking for a refreshing new take on things, a Health Coach is perfect for you! I went to myself Health Coach with the intention of learning about Essential Oils. When I got there, she asked me if that was the primary goal of our meeting. I think I surprised her when I told her I was open to everything. We talked about where my journey to health and wellness had started, how I felt lost in my professional life, and what I was hoping to find. I was tearful and vulnerable, but my Coach sat there and patiently listened and supported. It was after that meeting that I felt brave enough to email her and tell her my real dream. From there, I emailed my Healing Touch Practitioner and told her. The rest for me, seems like history. Since I’ve approached my friends and family with my new passion, everyone has been very supportive! I seem to strike up conversations about it just about anywhere. People see the changes I’ve made and see how much lighter and brighter I feel. Even this weekend a friend whom I hadn’t seen in over three years commented that I was like a before and after commercial, like I stepped out from an old cut-out to reveal a new me. So if you think you may be interested in a Health Coach, let’s talk! I would love to hear what you’re all about and find out if there is something I can help you reach and attain. It doesn’t have to be giant and life-changing at first, but I bet over time one little change now could be the key to life-changing things ahead. You just have to be willing to take the first step. Let’s do that together!